Ebuka Begged BBNaija Fans, Don’t Use My Face For Memes And Gif’s. 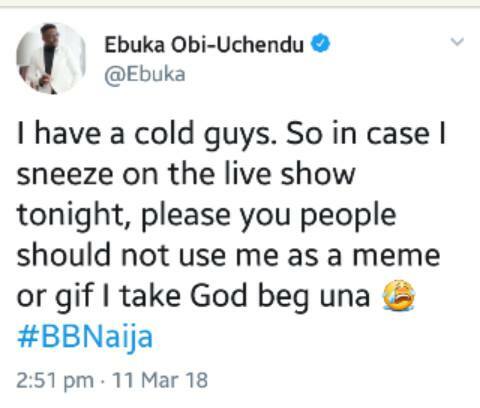 The Big Brother Naija 2018 reality TV show host, Ebuka Obi Uchendu has via his Twitter handle begged his fans not to use his face for any kind of meme on social media. According to the writer and lawyer, he had a cold and and is open to sneezing during the last eviction show. Ebuka who’s probably suspecting that he’d definitely make a funny face while sneezing decided to earnestly ask his fans and all Big Brother Naija viewers not to use his face for memes and gifs because he’s scared. BBNaija Evicted Housemates Awaits Homecoming Party In Nigeria, You’re Invited.